While the titles largely went the way they were expected to go, there were a few surprises on the podiums at the final round of the 2017 SuperGP Champions Trophy, held at Red Star Raceway on Saturday, 23 September. Clint Seller (MiWay Yamaha Racing R1) wrapped up the SuperGP title last time out at Phakisa and set about celebrating his fifth South African championship with some blisteringly fast times in practice and qualifying on Friday. He claimed pole position with a lap just over half a second quicker than his teammate Adolf Boshoff on the second MiWay Yamaha Racing R1 with Garrick Vlok (Diamond Core Drilling / Shop #74 Yamaha R1) completing the front row of the grid. Greg Gildenhuys (Autohaus Towing / Transport.co.za Kawasaki ZX10R) headed the second row ahead of Brandon Goode (Linex Yamaha / Brooke Refrigeration Yamaha R1) and David McFadden (Sandton Auto / BMW Motorrad S1000RR). Seller was untouchable in the opening race – his quickest lap was well over a second quicker than anyone else could manage – going on to win with eight seconds in hand. All the action was for the remaining podium positions with a superb three-way battle between Boshoff, Vlok and Gildenhuys eventually becoming a four-way fight after Michael White (Consortium Shipping Yamaha R1) worked his way through the field to join them. Boshoff managed to hold off his challengers and take his first SuperGP podium on only his third race in the premier class. Vlok, Gildenhuys and White followed him across the line with Allan-Jon Venter (Lekka Racing Team Hygenica Yamaha R1) just getting the better of Goode to take sixth. It looked like race two was going to be a repeat of the first race with Seller out front and Boshoff leading the chasing pack, but just before half distance things went wrong for the MiWay Yamaha Racing outfit. Boshoff crashed in turn two and Seller went down in turn three just a couple of laps later. While Seller was able to remount, Boshoff’s race was over. This left Vlok leading the way with McFadden and close attendance and Venter not far behind. They were joined by Gildenhuys and White, who again had to fight his way through from the back of the field. The win could have gone to any of them but Venter took the lead on the penultimate lap and was able to eke out a slight advantage to take his first ever SuperGP win. Vlok and McFadden completed the podium with Gildenhuys and White in fourth and fifth, the top five crossing the line within 1.7 seconds. Morne Geldenhuis (Hi-Tech Racing / NCA Plant Hire Yamaha R1) ended on a somewhat lonely sixth place. Michael White’s two rides from near the back of the field to fifth place gave him enough points to claim third in the 2017 SuperGP championship, behind Seller and Gildenhuys. Headed to Red Star, the SuperMasters championship was the closest of all the title races. Johnny Krieger (Lekka Racing Team Hygenica Yamaha R1) and Heinrich Rheeder (BMW Motorrad / Rheeder Racing S1000RR) were tied at the top of the log with Beau Levey (Motos Blu Cru Yamaha R1) just six points adrift. 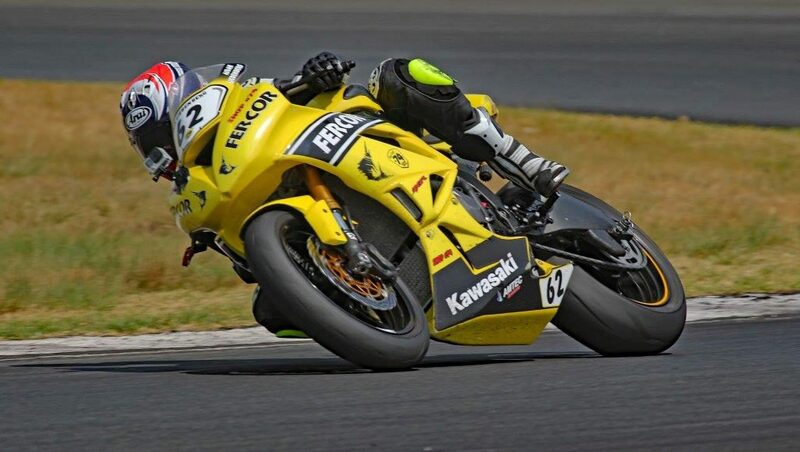 Levey indicated his intentions on Friday afternoon, qualifying just over a second quicker than Krieger with early season championship leader Hendrick de Bruin, now on a Paramount Tracks / RSA Racing Kawasaki ZX10R, in third. In the opening race Levy took a comfortable win from Krieger and de Bruin but a minor technical infringement saw him excluded from the results. This gave the win, and the championship to Krieger, with de Bruin and Neil van Loggerenberg (Motos Blu Cru Yamaha R1) completing the podium. In race two Levey showed his race one pace was no fluke, taking the win by almost nine seconds from Krieger and de Bruin. Rheeder had a day to forget, plagued by mechanical problems. As a result he didn’t score any points but managed to hang on to third in the championship behind Krieger and Levey. To claim the 2017 Super600 championship Blaze Baker needed to pilot his Uncle Andy Racing Suzuki GSXR600 to two wins. He gave himself a great chance of doing that by qualifying on the front row of the grid, just 0.161” behind pole sitter Aiden Liebenberg (Fercor Construction / Shop #74 Kawasaki ZX6) with Hayden Jonas (MiWay Yamaha R6) joining them on the front row. Dino Iozzo on the second MiWay Yamaha R6 headed the second row with Byron Bester (Hi-Tech Elements / Grange Workwear Kawasaki ZX6) and Jesse Boshoff (Phoenix Payroll Systems Kawasaki ZX6) alongside him. Baker grabbed the lead at the start of the first race with Liebenberg on his back wheel. The pair were never separated by more than a couple of bike lengths for the first half of the race, opening up a substantial gap over the rest of the pack. Shortly after half distance Liebenberg’s bike picked up a problem which allowed Baker to pull away and take a comfortable win. Liebenberg rode around his bike’s troubles and managed to hold off Jonas and Iozzo to take second. 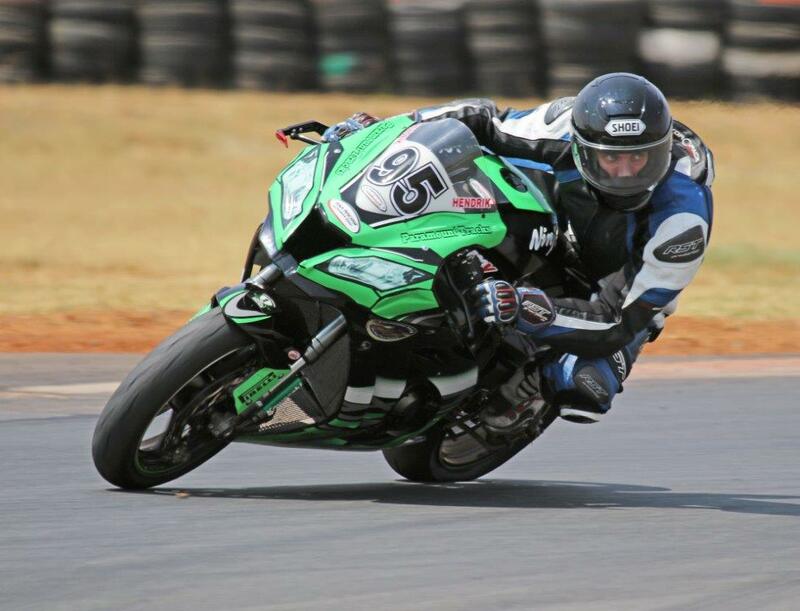 Bester got the better of his battle with Kewyn Snyman (ORT-Online.co.za Kawasaki ZX6) to take fifth. In race two Baker again grabbed the early lead, but tyre problems saw him drop down the field to eventually finish sixth. Liebenberg’s crew had sorted out the problem with his bike allowing him to completely dominate the race. Iozzo had his best finish of the year with a great second place ahead of Snyman. 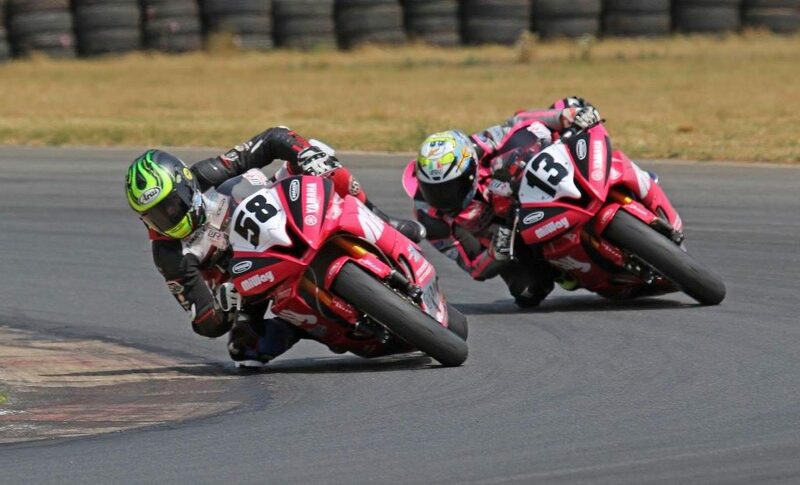 William Friend (Uncle Andy Racing Suzuki GSXR600) and Luke MacGreggor (Grange Workwear Kawasaki ZX6) were fourth and fifth respectively. With Baker failing to take two wins on the day, the Super600 championship went the way of Steven Odendaal (Petra Yamaha R6). Odendaal, who had a wild card ride in the Moto2 World Championship race at Aragon in Spain, also announced that he will be joining the Dutch RW Racing GP team next year and will be on the Moto2 world stage for the entire 2018 season. Baker had to settle for another runner’s-up spot in the championship with Jonas, despite crashing out of the second race, just hanging on to third. Ricardo Otto (Otto Racing / Inex Construction KTM390) needed to make up a 16-point deficit to Taric van der Merwe (Evolve Nutrition KTM390) to stand any chance of claiming the 2017 SuperJunior title. He set about it the right way, taking pole position from van der Merwe with Dominic Doyle (Otto Racing KTM390) in third. The second row of the grid was headed by Tyreece Robet (Uncle Andy Racing KTM390) with Chase Hulscher (Exis Engineering KTM390) and Blake van der Merwe (Evolve Nutrition KTM390) alongside him. Otto took the lead from the start of the opening race, but had van der Merwe and Doyle right behind him. The trio opened up a huge gap over the rest of the field as they passed and re-passed each other. Otto was in front when it counted, taking the flag ahead of Doyle and van der Merwe and reducing the deficit in the championship standings to just seven points. Knowing he needed to finish at least second to be sure of the title, van der Merwe went all out at the start of the second race, taking the lead and slowly opening up a gap on the chasing pack until his gear linkage broke and he was forced to pit. While he was able to re-join the fray, he was too far back to fight for a podium position. This left Otto in front but Robert, who dropped out of the first race with a mechanical problem, slowly reeled him in and took the final SuperJunior race win. Otto finished second with Doyle in third. Otto took the championship from van der Merwe and Robert. In the support categories Shaun Jubber (KTM) took victory in both BOTTS races from Dave Griffin (KTM). Mick Landi (Rehab Racing Ducati) and Alan Hulscher (Aldor Steel Fabricators Ducati) each took a third place. Augustin Ntwari (Lekka Racing Hygenica Yamaha R1) and Tyron Piper (Yamaha R1) shared the Bruch Run wins. In the 250 Cup Luca Balona (Hi-Tech Racing / Grange Workwear Kawasaki) and Ricardo Otto (Otto Racing / Inex Construction Kawasaki) each took a win and a second place with Deegan Claasens (Team Hygenica Kawasaki).